Strategic Management means goal-directed decisions and actions in which its capabilities and resources are matched with the opportunities and threats in its environment. It is the process of analyzing the current situation, developing appropriate strategies, putting those strategies into action and evaluating, modifying, or changing those strategies as needed. Strategic Management is all about identification and description of the strategies that managers can carry so as to achieve better performance and a competitive advantage for their organization. An organization is said to have competitive advantage if its profitability is higher than the average profitability for all companies in its industry. It is important to focus on the key parts of this definition. First, strategy involves an organization’s goals. Second, it involves goal-directed actions – implementing the strategy. Finally, the organization’s strategies should be designed so they take into account its key internal strengths (capabilities and resources) and external opportunities and threats. This “matching” idea is important to the concept of strategy and strategic management. Strategic Management gives a role to everyone in an organization to manage strategically. It helps the organization perform well. It helps the organization to effectively cope with the uncertainties in the external and internal environment. It helps to coordinate various functions and activities. It is important for students to know why the field of strategic management is vital to organizations and, more importantly, to them. Regardless of what their major is or where they hope to work (accounting firm, online retailer, etc. ), the key assumption in this book is that everyone in an organization plays a role in managing strategically. Matching key internal strengths with external opportunities and threats. 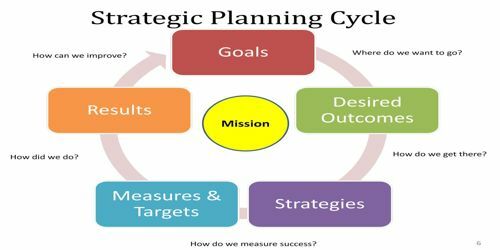 Strategic management is the process in which an organization develops and implements plans that espouse the goals and objectives of that organization. 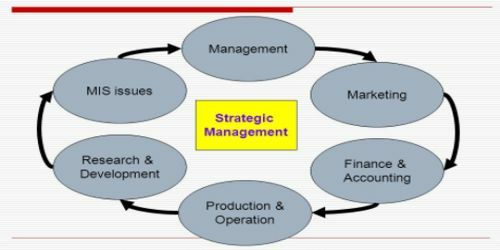 The process of strategic management is a continuous one that changes as the organizational goals and objectives evolve. Small businesses engage in strategic management to ensure that they adapt to trends and external changes such as globalization. Several key concepts characterize strategic management and the development of organizational goals. Strategy Implementation: Putting the organization’s various strategies into action. Strategy Evaluation: Evaluating how the strategy has been implemented as well as the outcomes of the strategy. It is not enough for an organization’s employees to develop or formulate great strategies – these strategies have to be implemented. The approaches to implementing the various strategies should be considered as the strategies are formulated. An organization’s employees should monitor both the actual implementation of the strategy and the performance outcomes of strategies that have been implemented. Who’s Involved with Strategic Management? Board of Directors: Elected representatives of stockholders Play significant role in corporate governance. Top Management Team: Ultimately responsible for every decision and action of every organizational employee. Act as strategic leaders. Other Strategic Managers and Organizational Employees: Responsible for strategy implementation and evaluation. Corporate governance is the determination of the broad uses to which organizational resources will be deployed and the resolution of conflicts among the myriad participants in organizations. Sarbanes-Oxley Act of 2002 – a U.S. federal law designed to protect investors by improving the accuracy and reliability of corporate disclosures.